Size of this preview: 800 × 582 pixels. Other resolutions: 320 × 233 pixels | 640 × 465 pixels | 1,024 × 745 pixels | 1,280 × 931 pixels | 1,800 × 1,309 pixels. English: Founded by William Sublette and Robert Campbell, Fort Laramie lay at the crossroads of an old north-south Indian trail and what became known as the Oregon Trail. Called Fort Laramie because of the nearby Laramie Mountains and the Laramie Fork of the North Platte River, the post was approximately 150 feet square, according to Miller, with bastions at the diagonal corners. 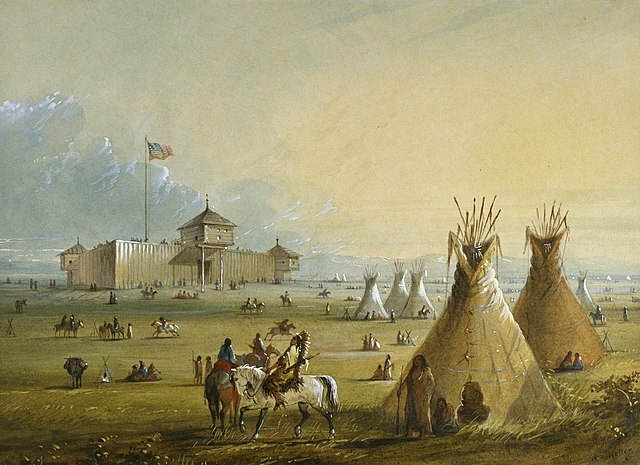 Miller's paintings are the only known visual records of the fort, because the original fort was torn down in 1840 before any other artist had traveled the Oregon Trail; it was replaced with another structure, located perhaps on the same site in 1841. Alfred Jacob Miller: Maryland and the West. The Walters Art Gallery, Baltimore; Frostburg State University, Frostburg; Jewish Community Center of Greater Washington, Rockville; Washington College, Chestertown. 1988.